But not for the 1.1 billion reasons that you think. Sure, I’m a little professionally jealous that I’ve never had a client sell themselves for $1.1 billion. But it’s not like I had a chance to invest in them and passed. Heck, I had hardly ever heard of Tumblr until about 18 months ago when they raised $85 million on an $800 million valuation and had no customers. I admit to scoffing then…probably even blogged about valuation bubbles. But I didn’t loathe them then…like I do now. I loathe Tumblr because they made me feel stupid. Granted, it isn’t the stupidest I’ve ever felt. I mean, there was that time when I volunteered to clean our oven…Step 1) spread newspaper over the oven burners; Step 2) thoroughly spray the inside of the oven with the spray-stuff; Step 3) turn oven to “high” to activate the spray-stuff; 4) See smoke coming from the oven and rush the forgotten (and now smoldering) newspapers across the kitchen to the sink and douse the flames. Tumblr doesn’t make me feel THAT stupid. Bad Advice Step 1) “Start a company that delivers a product or service that solves some problem that a large set of customers has.” It’s good that Tumblr didn’t take that advice. If they had taken that advice, they never would have come up with such an incredibly useful social media platform that allows me to gaze at pictures that people share with each other, even the borderline pornographic ones. Of course, there were several dozen other platforms out there already allowing this to occur and I would have been wrong to keep blabbering on to them about “I think you need a better customer value proposition”. So identifying a customer problem and then building technology to solve it was bad advice. I should have suggested developing technology to solve no known problem. Bad Advice Step 2) “Obtain customers.” Pretty naive. I definitely would have told founder David Karp that since he didn’t at first follow my Step 1 advice above–solve a customer problem first, build the technology second–that he should now find a customer base where his nifty, scrolly technology might be useful. Look for a revenue model that would allow you to build a business. Instead, he simply went out and let users, (by the way, users are the exact-opposite of customers), pile on the site and jack up hosting and serving and support costs. Business model, schmizness schmodel. Bad Advice Step 3) “Don’t raise more money than you need.” Duh. Nearly as stupid as leaving the newspapers inside the oven when trying to clean it! Tumblr raised somewhere in the neighborhood of $125 million on ever-higher valuations. Increasing valuations, mind you, for a company that basically burned increasing amounts of cash for every new user at the site. Apparently the old joke about the CEO who lost a nickel on every dollar of sales but who would “make it up on volume”…wasn’t so funny after all. Bad Advice Step 4) “Yahoo’s offer is just the tip of the iceberg…I’ll bet AOL will pay $1.3 billion” Ok, I probably wouldn’t have given that last piece of advice. 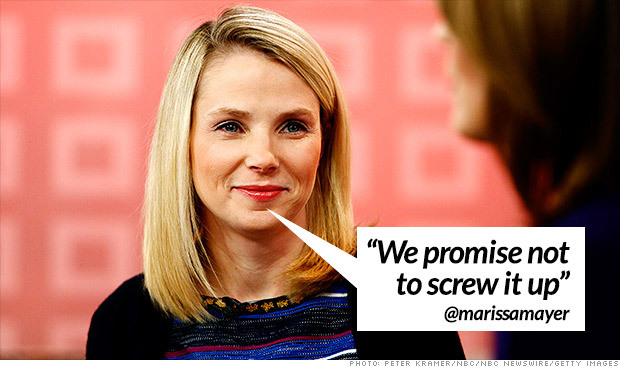 Of course, I also wouldn’t have advised Yahoo to pay $1.1 billion. They basically paid $10 for each of the 108 million Tumblr tumblebloggers on the site. But that includes my Tumblr blog, even though I haven’t visited my Tumblr blog in many months. I think that clearly proves they overpaid by about $10 at least. The good news from the acquisition is that I hope, soon, my Yahoo! home page will have the ability to scroll a news feed for crying out loud. No, Tumblr has ruined not only my outward reputation but also my inward self-confidence. Tumblr (and Instagram while we’re at it) have shown the entrepreneurial community the way the new economy works and clearly showed that this old-school incubator manager only ever really got one thing right…that Color Labs never should have taken that $41 million in 2011! Wait a minute…it can’t be…that car that just pulled up in front of Color’s office…isn’t that a Google car full of Google-Glass-wearing Google guys?? This entry was posted in Commentary/Editorial, Entrepreneurial Advice, Just Kidding and tagged entrepreneurs, founder advice, founders, new venture, Tumblr, valuations, venture tips, Yahoo. Bookmark the permalink.